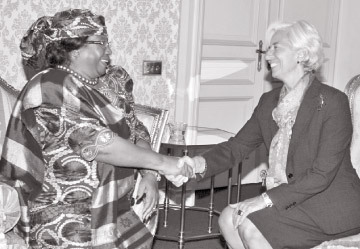 IMF chief Christine Lagarde on Saturday praised Malawi's President Joyce Banda for “bold” economic recovery reforms, saying the measures will lead to a turn-around despite their unpopularity. “Notwithstanding the current hardships, many of my interlocutors were confident the ongoing reforms will turn the economy around, an optimism that I share,” said Lagarde, wrapping up an official visit to Malawi. During her trip, Lagarde has praised the reforms which she said had restored stability after Banda inherited a serious crisis characterised by foreign exchange shortages that crippled key imports such as fuel. Banda has overseen the devaluation of the kwacha currency by 50 percent, the easing of foreign exchange restrictions, and the raising of fuel prices and cutting of subsidies since taking office last April. Criticised at home for floating the currency under pressure from the International Monetary Fund, she has assured that “there will be no backtracking”. “I welcome government efforts to address unforeseen challenges through her continued commitment to economic reforms,” Lagarde, the fund's managing director, said in a statement. She said the country had already made “significant progress” in addressing serious imbalances that were hampering economic growth just a few months ago. Lagarde said during meetings with Banda, she stressed the “need to stay the course, while putting in place social protection programmes to alleviate the impact of adjustment measures on the poorest households.” She said Malawi's recent economic situation has been difficult, adding that drought and lower than expected foreign exchange earnings had “dampened growth and contributed to a spike in inflation in 2012.” Earlier on Saturday Lagarde stressed the need for Malawi to diversify its economy, saying a reliance on agriculture left the country and its economic recovery vulnerable. “Following these reforms, the economic wheels started spinning again. But progress is threatened anew by a slump in agriculture,” she said, with the sector accounting 30 percent of GDP and tobacco nearly half of export earnings. The fund has halved its 2012 growth forecast for the impoverished nation to around two percent but predicts a rate of 5.5 percent this year. Private sector investment must be made easier and poor infrastructure in areas such as electricity and transport upgraded, she said, with Malawi scoring 129 out of 144 countries in the World Economic Forum's Global Competitiveness Index. The IMF, one of the main backers of the country's reforms, gave Malawi a three-year $157 million loan package in June after ties had broken down amid a spree of global aid suspensions under president Bingu wa Mutharika.